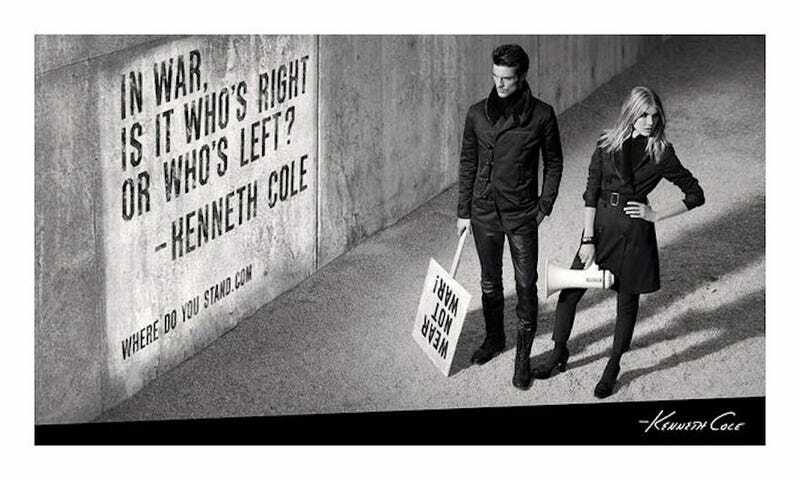 In a helpful Instagram video addressing his Thursday tweet about how we should all make shoes, not war, Kenneth Cole cleared up any confusion about his motives surrounding his often insensitive tweets. I've always used my platform to provoke dialogue about important issues, including HIV/AIDS, war and homelessness. I'm well aware of the risks that come with this approach and if this encourages further awareness and discussion about critical issues, than all the better. Cole is the rare designer whose personal Twitter feed is weirdly similar to the ads his company puts out, a fact the company is coincidentally celebrating this fall with a website devoted to their entire history of branding choices entitled 30 Years Bold. While the site isn't fully up and running yet, there are four videos, all devoted to Cole's advertising choices and how they're tied to his philanthropy. While HIV/AIDS is his pet project (he's been involved with amfAR for ages) he also often comments on whatever war the United States is getting itself into at any given moment. "I didn't plan on combining my business and philanthropic agendas; it just happened," Cole says in one video about launching Kenneth Cole in the 1980s with controversial ads about HIV/AIDS awareness as he tried to sell "cool products...to cool people." "I felt the need to connect with those people in a meaningful way." "Did we engage consumers? Although it's not why we necessarily did it, I believe we did," Cole continues. "Did we offend a few along the way? I know we did. Was it worthwhile? Was what we did the right thing to have done? I believe wholeheartedly it was." "I'm often asked, are businesses interests and our community's interests related or are they independent?" Cole goes on to say. "I believe that they are related, not only related but interrelated and not only independent but interdependent. I believe that all businesses will come to this conclusion and if their hearts don't get them there first, eventually their balance sheets will." There's no social commentary in this sentence (nor has there been in the past with the tweets of Cole's that have also been poorly received which he's had to apologize for) about how we shouldn't be involving ourselves in Syria, only a shameless plug to think about his product. That's the difference between this and his other more thought-provoking work that he's been praised for, and one that Cole – who has been working in this industry for a long time – should know that his audience is smart enough to pick up on.